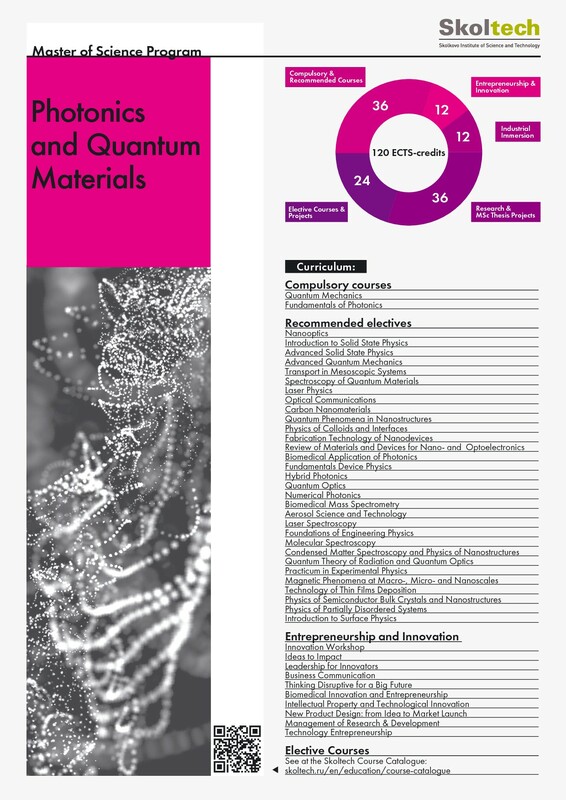 The MSc program Photonics and Quantum Materials is the joint network-form effort with Moscow Institute of Physics and Technology, Institute for Spectroscopy RAS and Institute of Solid State Physics RAS. The program has a strong interdisciplinary research and education nature, conducted by experts from various areas of physics and material science. Bachelor’s degree or its equivalent in Physics, Chemistry, Materials Science or Electronics. It is expected that applicants are able to demonstrate good knowledge of Mathematics (Calculus, Ordinary differential equations, Linear algebra, Probability) and Physics (General physics, Electricity, Quantum mechanics). The aim of the program is to provide knowledge and lab expertise in photonics, bio-photonics and nanoelectronics, as well as to prepare students to apply apply fundamental science and engineering approaches to higher-level research and industrial tasks. To prepare Physists for careers in University teaching, research and in institutions. The curriculum covers main topics in contemporary optics and condensed matter physics. The educational program is structured into three strongly integrated tracks realized jointly with Academic Partners: A) Photonics and Quantum Materials (Skoltech), B) Spectroscopy, Quantum Optics and Nanophotonics (ISAN), C) Physics and Technology of Nanostructures (ISSP RAS). Develop a commitment to life‐long learning and professional development. Students graduating with a Master of Science degree in Applied Mathematics and Physics are in great demand throughout the international high-tech market.